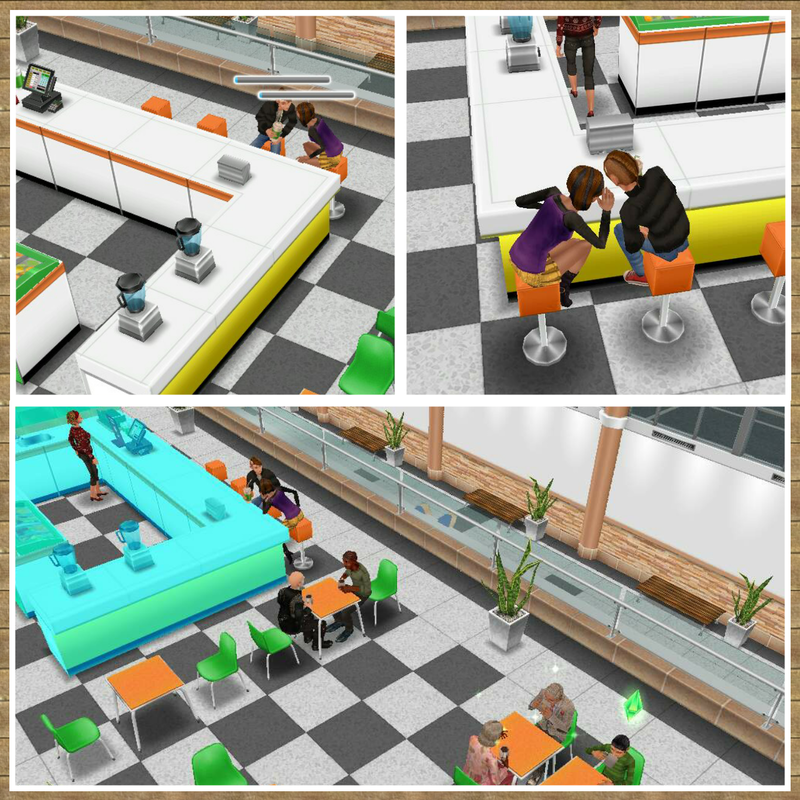 Once you complete the Catwalk Model hobby, build the stores and clean up areas 3 and 4 of the mall (see my guide to the mall for more details) you will be able to build the bowling alley and then your teen and adult sims can bowl. After the time has passed come back and click the exclamation mark above your sims head to find one of the bowling collectibles. 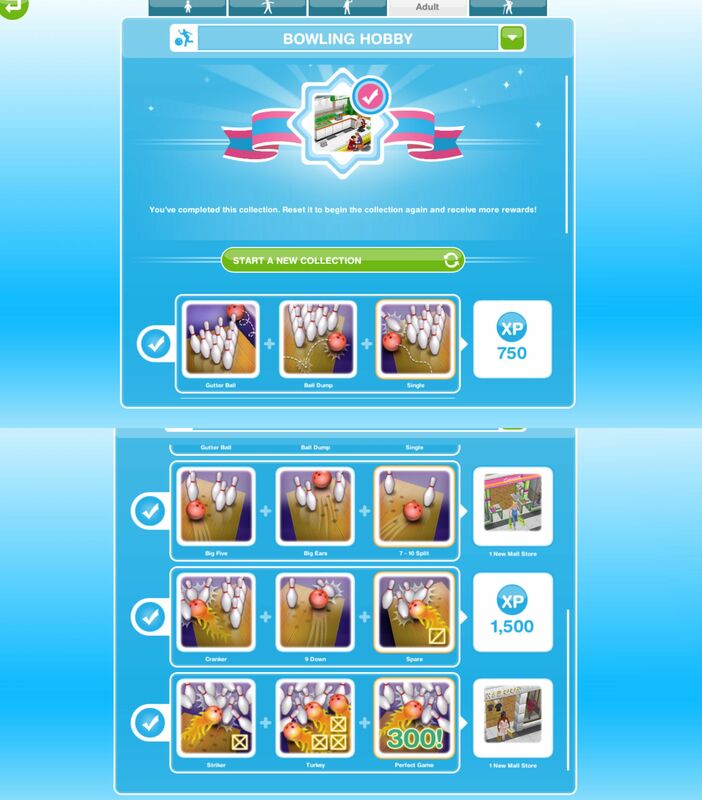 Every time your sims bowl their bowling hobby skill level up percentage will increase, once you reach 100% you will level up, there are 6 levels. You need to reach level 6 to be able to unlock all of the bowling collectibles, once unlocked you will be able to find them. The Perfect Baller Spare, Turkey and Perfect Game are now unlocked in the hobby collection. NOTE: you need to press the upstairs button at the mall to get the icon to build the juice bar, if you can’t see the button you need to have a sim go to the mall. Click on a bench on the left side upstairs as if you want that sim to “rest from shopping.” The icon should appear now. You can have a sim mix juice for 10 hours and teen, adult and senior sims can sit at the table and wait for drink order for 10 minutes, they will then take 8 minutes to drink it. This hobby is bugged for me I keep getting the same two over and over again. It is very annoying. Once you unlock the dream for teens, where do you buy them? Just have them “move out” of town and recreate them with the name you want. Are you going to write a post for the new castle/medieval/royalty quest stuff? If you start a new collection for the Bowling Hobby are there any new rewards after earning all the different moves again? I unlocked all of the parts of the shoping mall, except the last one. I also build all of the shops, but i cant unlock the last part, which also unlocks the bowling hobby. I cleaned the whole mall, so i dont understand why i cant unlock the last part. Do you know something that might help? In the bowling alley, what is the purpose of servicing the counter at the entrance? I understand the servicing the burger bar so other sims can eat but this servicing I’m not sure what it should be used for? It is just something else to do, there is no real purpose for it. I have completed the catwalk hobby but the bowling still hasn’t unlocked. It says I need to win the “grand prize” in the catwalk hobby. What is the grand prize that I need to win in order to unlock bowling? I think the problem is because the latest quest required the catwalk hobby it didn’t recognise it as completing to unlock the bowling alley if that makes sense, this issue will probably be fixed in the next update. My bowling alley is not able to be opened. I’ve completed the catwalk hobby 5 times (did it for the pajama contest) cleaned all areas of the mall and built all the stores (except the 2 that need the bowling hobby to be completed) it does not give me the option to build the bowling alley. I’m frustrated. I had the bowling hobby collection done like weeks ago. And I didn’t build the juice bar yet cause I was building a horse stable at the time. I just went to the mall to see if I can build the juice bar and I couldn’t find the lock for the juice bar. Is the juice bar over already? Ive completed all the bowling hobby but i cannot find the icon for building the juice bar. I also opened all the shops already in the mall. How do you build the juice bar? Thanks! I’m not seeing an upstairs option at the mall. I already have Pickle Sauce built but I can’t unlock the escalator to the Juice Bar section. I just finally completed the bowling hobby. If you can’t see the button you need to have a sim go to the mall. Click on a bench on the left side upstairs as if you want that sim to “rest from shopping.” The button should appear now. I have finally finished the bowling hobby && built the last store but the space for the juice bar is still empty. I tried waiting a few days and the option to buy it is not there. Was there a time limit on that hobby to be able to access the juice bar? I completed the bowling hobby and got the message saying that I unlocked the juice bar but it’s not there. I did have about 5 boxes left in the mall so maybe that’s part of the issue? Do I need to build all the stores first? I had two of my sims do the bowling hobby so I could finish it faster. I completed the hobby almost two weeks ago and it said I unlocked the juice bar, but the juice bar icon isn’t where the juice bar should be. It’s just an empty floor. Is the juice bar no longer an option? I had two sims do the bowling hobby, and when they finished, it said that I unlocked the juice bar. However, in the space where the juice bar should be, there is no hovering icon. So, I don’t have the option to build the juice bar. What can I do about this? 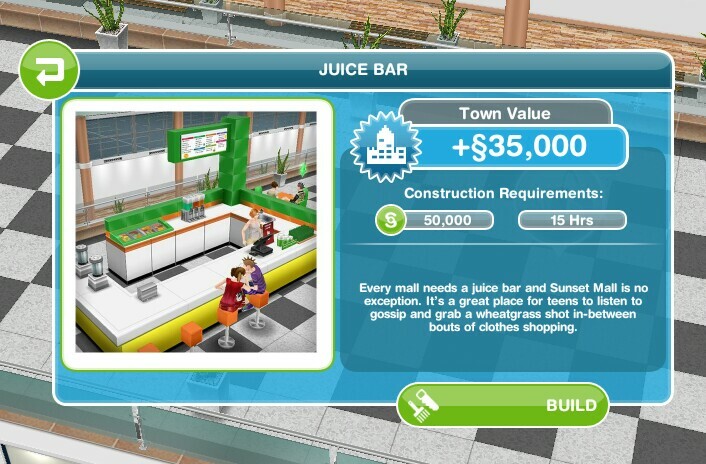 I completed all of the bowling level actions and built all of the shops in the mall but I don’t have any option to build the juice bar (I don’t even see the lock sign). Have you heard of this glitch? I completed the bowling hobby yesterday, but the juice bar didn’t unlock. Is there anything I need to do to unlock it? I completed the bowling hobby but did not receive the juice bar. Why is this? I finished the bowling hobby but for some reason i can’t find the button to build the juice bar. Do I have to build all the malls? you need to press the upstairs button at the mall to get the icon to build the juice bar. Hi, I finished the catwalk model hobby and I can’t access to the bowling hobby, I need to build all the stores to access? Tank you for your help. I can’t remember exactly, probably about 2 weeks, some are just harder to find than others the only advice I can really give you is just keep on going, you will get them eventually. I completed the bowling hobby but haven’t built the juice bar, I don’t have an arrow to go upstairs though.. I was completed bowling hobby, but i cant unlock juice bar? What is happend? I just finished the bowling hobby and got a message that the juice bar is unlocked, but I can’t build it in any way and there is no button for going to the second floor of the mall Does anybody else have this problem? I found a solution on the Sims Freeplay Support site! This issue is listed there as a known problem as of yesterday and the solution is to tap on one of the benches on the second floor. Hi, I’ve completed the bowling quest and can’t build the juice bar. I’ve read your advice for others that you need to go up a level. I don’t have the icon to do that? I’ve check the restaurant and it’s there to go up to the second floor but not at the mall? It wasn’t there when I built the burger bar either and I’ve built that? Thanks for all your blogs they are so useful. I have completed the bowling hobby and have the mall cleaned up. I have tried to access the burger bar since, as well as build the juice bar, but both sets of escalators are blocked. How do I open the escalators to access the second floor? have you tried tapping on the second floor where the juice/burger bars should be? how do you unlock memory lane i unlocked the wish fountain but when i get to memory lane it still has a grey lock on it and it says i have to have 8 stores but i’ve built all the stores they let me everything else wont unlock someone please let me know how to unlock this freakin memory lane. I’ve had 2 Sims bowling and they are level 6 but they still only get gutter ball or other level 1 or 2 shots. It’s so frustrating, especially after 6 1/2 hours. Is there a bug? Thanks for your posts, just looking at the hobbies list I’ve realise how many more there are I’ve not got access to yet! No there isn’t a bug, the bowling hobby just seems to take a while! I think I got gutter ball about 20 times in a row! You’re welcome! To be honest there are still hobbies missing from that list that I haven’t done yet either! off all the 3 missions it looks like it not reconized that i already did all the requirements.. I don’t think preteens can have smoothies at the juice bar anymore. I sent my preteen to a neighbor’s sunset mall. With no one servicing the burger bar or juice bar, my preteen could still wait for burger, but it says en only adults seniors and teens can have juice. Btw, yes, I am clicking the tables and not the actual bar itself. Looks like you are right! They definitely used to be able to, thanks for the update! I have completed the Juice bar but I can’t seem to be able to build the escalator beside it. I have had this issue for over 6 months now. What am I doing wrong? Do you mean the one that goes up to the floor above? Have you tried building the escalator on the other side? I’ve been playing this hobby for months and it still hasn’t given me the last 3 icons! Am I doing something wrong? You aren’t doing anything wrong, this hobby takes a long time to complete, it took me forever. You just have to keep going, you will get them eventually. Hi, I’m confused about something. When you posted this: “The rewards for completing this collection are the juice bar and 5 LPs”, did you mean we’re supposed to receive 5 LPs alongside the juice bar, or that we’ll receive 5 LPs every time we complete the collection afterwards? I’m asking because my Sims finally completed the bowling hobby tonight, and I did receive the juice bar, but no LPs. You get 5LPs everytime you complete this hobby after the first time. Okay, I just wanted to make sure. Thank you.